Are you ready to experience the next level of creating that `wow’ jewellery you visualize, and want the world to see it too? Get set to show what you’ve got with the Computer Aided Designing (CAD) course at IGLI that will help you do away with the tedious, time-consuming hand drawn creations, and craft jewellery designs on the computer with impressive accuracy and speed. Empowered by the revolutionary jewellery designing software – Matrix – this interactive course promises to bring alive your creative spark and enhance the uniqueness of your custom jewellery designs through computerized software. 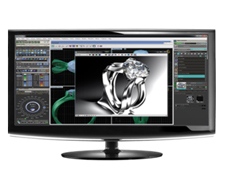 Matrix is software that provides jewellery-specific and jeweller-friendly tools to design virtual 3D jewellery on screen and create photo-realistic images of your designs. It combines the raw CAD power of Rhino 3D, the organic modelling of T-Splines, the stunning render images of V-Ray and Gem Vision technology to create the ultimate 3D jewellery creation tool. These tools are flexible and intuitive, and they can be easily learned and used. Students can explore a huge database with ready components & create artistic designs that define their style. Surprise your customers by letting them see their dream jewellery before it is made, and empower your business by calculating the volume and weight of the final product in just one click, saving time and enabling product standardization and accuracy. This course is ideal for Jewellery business owners, manufacturers and designers. Only basic knowledge in computers in sufficient to master the software in just a few weeks! Successful completion of this specially developed course, leading to award of `Certificate in Computer Aided Jewellery Designing’, will help you create world-class jewellery designs.